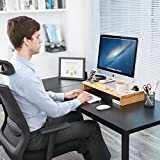 Find the best computer monitor stand and productivity in the workstation will significantly improve. This is why you need to take time and select the ideal monitor stand and not buy the first one you get. 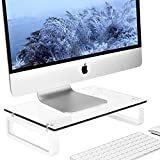 Computer monitor stands come in different designs and brands and choosing the best requires a keen eye for features, personal needs, and price. The best stand should be durable, flexible to use and made of the highest quality materials. 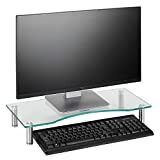 We’ve researched the internet for the leading computer monitor stands and selected these ten options for you to c buy. These are the best picks currently and best placed to offer you an excellent value for your money. This is one of the most straightforward computer stand monitors with adjustable height riser from 2.17, 4.1 and 5.6 inches. 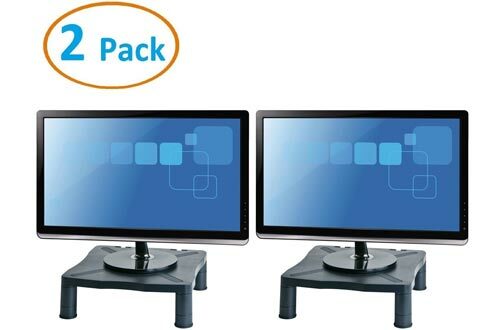 This sets the screen at the right viewing angle to suit your height and sitting position. 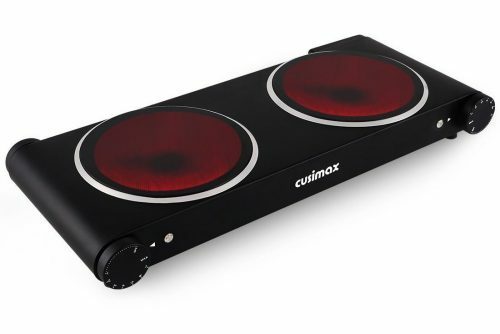 The monitor is durable and sturdy featuring the strong ABS plastic and an MDF platform. It is easy to assemble stand with a simple removal and addition of the leg segments. It also features good cable management and multifunctional use. 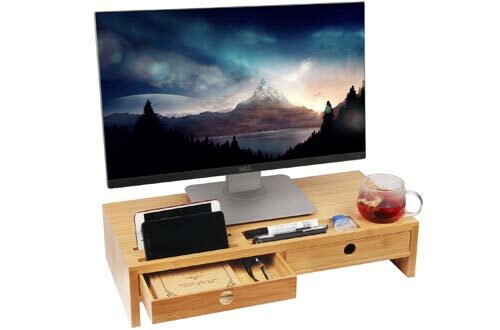 This is a wooden monitor computer stand with an adjustable length to hold up to three computer monitors. You can quickly adjust the stand length from 26.5 inches to 44.8 inches through a sliding mechanism. 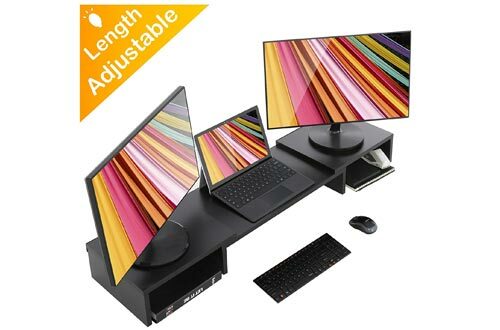 This flexible adjustment allows for use one, two or three monitors depending with your needs. It also features better height ergonomics to reduce neck strains. 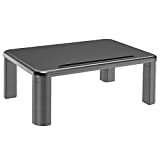 Overall, it is a durable, sturdy and nice finish table with an organizer to store your keyboard and mouse. 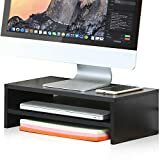 This is another smart and multifunctional computer monitor stand that can support TV monitors, PC screens, and laptops. 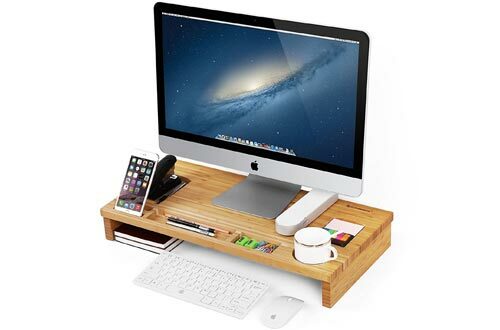 It features a shelf for holding the keyboard and mouse. 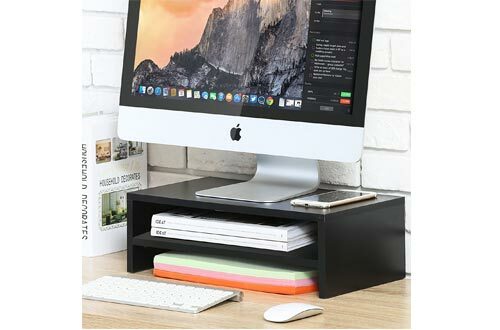 The keyboard shelf is a space-saving design easily sliding below the desk. There is another slot for keeping items like phones and for proper cable management. This is a 5.6-inch desk ideal for best visibility. It reduces back and neck pain making it ideal for both home and office desk. 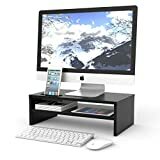 The SONGMICS computer monitor stand is an eco-friendly choice made from a sturdy bamboo board to serve you for long. It holds more weight than most plastic desks. The maximum load is 80lbs. 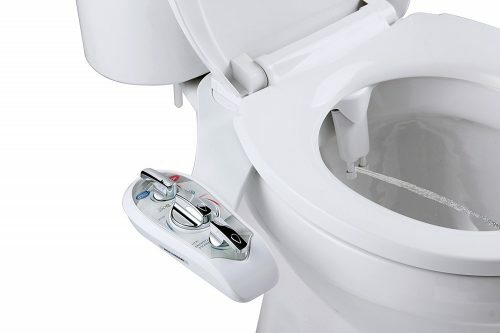 This is a 3.3-inch high stand for comfortable eye level. It gives users an ergonomic viewing angle reducing neck strain and eye tension. It is a versatile stand that also holds cups, smartphones, papers, clips, and stapler safely. The corners are polished and smooth offering maximum protection at home or office. 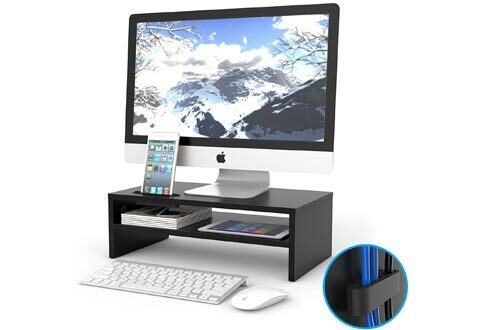 The Halter computer monitor stand is a pretty simple design that features a laptop riser, desk shelf, a computer stand and printer stand. It is a versatile stand to hold a wide range of office items safely. The stacking column riser gives users the most comfortable viewing angle. The strong plastic panel is durable and can support big monitor panels measuring up to 24 inches long. It also features a non-skid rubber fit that prevents sliding of the monitors. Overall, these are great to pack stands worth buying. 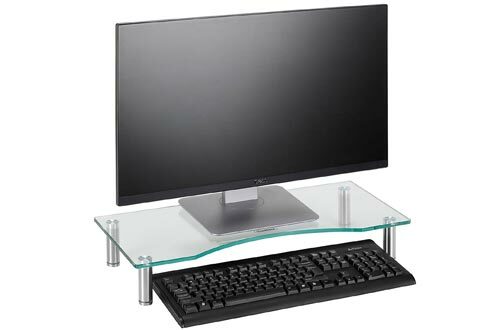 This is another versatile monitor stand capable of accommodating monitors, printers, laptops and fax machines. It features a stow that keeps the keyboard and mouse. 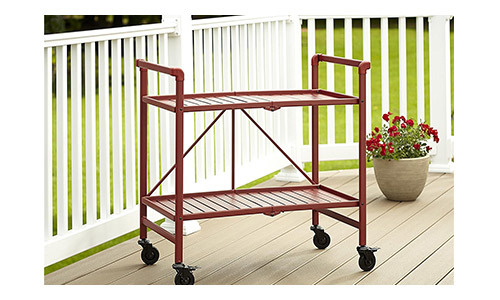 The stow is a space-saving design that helps with better organization. The simple and slim design of this standing desk makes a good fit for offices or homes with minimal space. 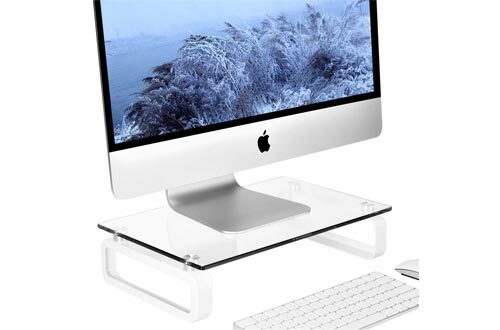 Overall, this is a multifunctional stand that you can also use a TV stand. The Monitor Stand Riser feature perfectly designed drawers that store the every-day items at the office. 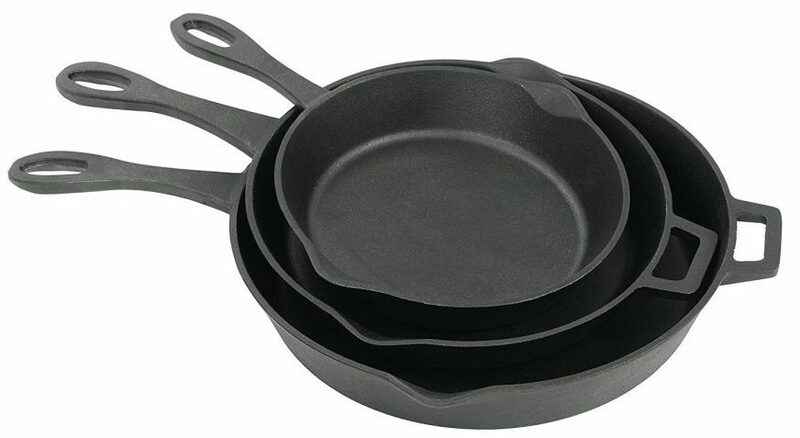 It is a quality selection with a nice smooth finish to feel safe and warm. The drawers are of the highest quality, easy to open and close. 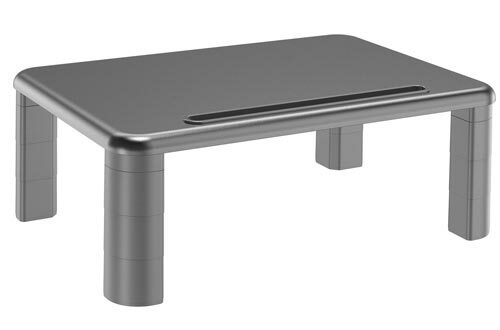 This is a versatile stand for TV, monitor, speakers, laptops and several office stationery like printers. It is a space-saving design that gives you surface to place your phone, cup, pen, and keyboard. 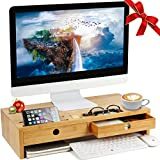 Overall, this is a high-quality bamboo construction computer monitor stand. 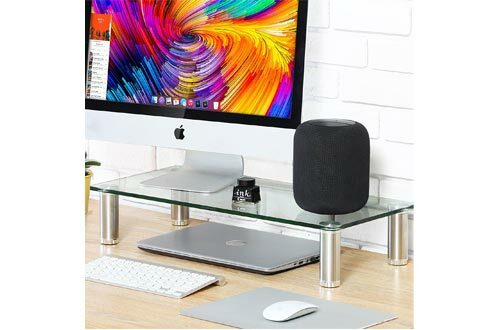 This is another excellent design stand with a lovely glass top and a 4.6-inch height to give you the ideal viewing angle. 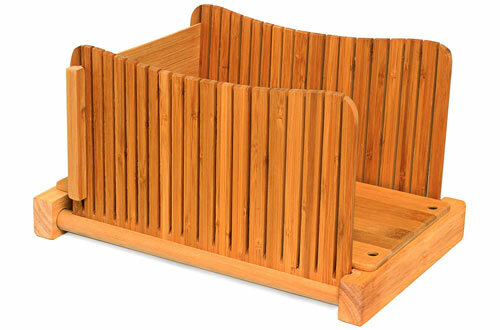 It is a sturdy and smart design with an underneath slide for storing the keyboard. The stand is multifunctional and can be used for other things like TV stand, laptop, fax machine, printers and much more. It is easy to assemble and makes a suitable choice for both office and home. The elegant looks add to your interior décor leaving your room looking stunning. 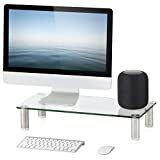 This is a personal computer monitor stand with a lovely tempered glass top and round polished edges for safety. It is a top-rated choice for most home offices adding its elegant looks to your home. 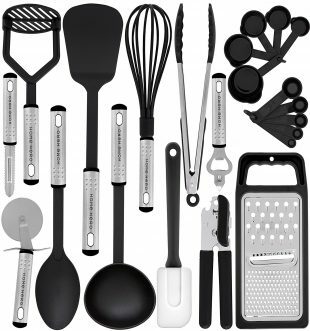 Assembling with all tools and hardware included is easy. All that is needed is screwing of the tempered glass and metal legs. It is a quality choice that comes in a quality package. The rising height and size are perfect for the best viewing angle. This is a curved glass monitor with a simple design ideal for modern homes and offices. It features a curved out a glass to easily allow for better cable management. This stand is a sleek design raising the monitor to the ideal height for your eye. The tempered glass is thick and strong 1/3-inches thick for durability. The aluminum feet are tubular and height adjustable from 3.5- 4.3 inches. 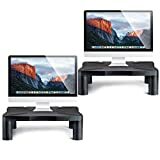 Change the looks of your office or home office by choosing these amazing computer monitor stands. 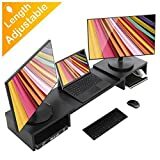 These are the best computer monitor stands on the market currently with a wide range of features that allow for better viewing angles and improved productivity. Choose from our list which narrows on the leading brands for the best value for your money.